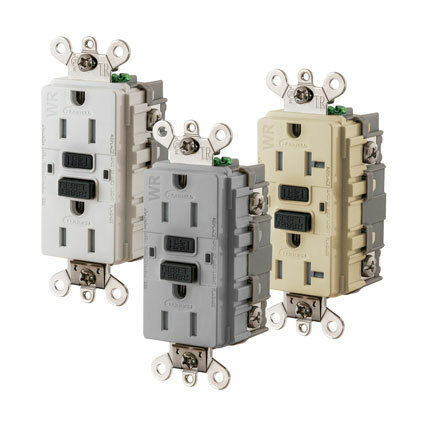 Hubbell Wiring Device-Kellems is pleased to announce its new Extra Heavy-Duty Industrial Ground Fault Receptacle. The new receptacle now features a corrosion-resistant design that protects critical components from moisture. Internal and exposed parts are nickel plated, and a selective conformal coated printed circuit board (PCB) is applied to critical components and tracks on the PCB, as well. Terminal and mounting screws are stainless steel. A new triple-wipe contact design includes a nickel-plated high-performance copper alloy, which features excellent electrical and thermal performance under ambient and high temperatures. This makes the Extra Heavy-Duty Industrial Ground Fault Receptacle ideal for demanding applications such as manufacturing facilities, laboratories, hospitals, garages, mobile power applications, and assembly lines. New rectangular “clear light pipe” indicators provide a visual representation of the device’s ability to provide people protection: green (power), red (a trip), or flashing red (end of life). Oversized buttons make it quick and easy to test and reset the device, even while wearing work gloves. For enhanced protection, a safety “trap door” cam-action design limits improper access to energized contacts without restricting plug engagement. For more information about the Extra Heavy-Duty Industrial Ground Fault Receptacle, contact your Hubbell sales representative or visit www.hubbell.com/wiringdevice-kellems/en. Hubbell Wiring Device-Kellems is pleased to introduce a new full line online catalog featuring valuable information on product solutions that is shareable, downloadable and printable. Several features have been added, including an improved search function and one-click access to spec sheets. All features are available when using a computer, tablet, or smartphone. Hubbell Wiring Device-Kellems’ new line of inSIGHT™ Data Monitoring solutions is designed to help industrial manufacturers and data center owners use information and analytics to better predict and prevent costly downtime. These devices provide data directly at the point of use, and while helping to predict potential process deviations. Hubbell Wiring Device-Kellems is excited to announce its Low Voltage Wall Switch and 0-10V dimmer, offering low-voltage switching and 0-10V dimming in one device. Smooth dimming operation gives users the ultimate control. The device can remember the last dimming level set, and reset lights to that brightness.